Rep. Alexandria Ocasio-Cortez is dinging Facebook, Microsoft and Google for "implicit" support of climate change denial in a letter addressed to the CEOs of the three tech companies, according to CNBC. Facebook, Microsoft and Google were "high-level" sponsors of the recent LibertyCon conference in Washington, D.C., which hosted a session "denying established science on climate change," Ocasio-Cortez, D-N.Y., and Rep. Chellie Pingree, D-Maine, said in the joint letter. "The example you have set promoting sustainability and evidence-based science is compromised by your implicit support of the session organized at LibertyCon," the congresswomen wrote. "Given the magnitude and urgency of the climate crisis that we are now facing, we find it imperative to ensure that the climate-related views espoused at LibertyCon do not reflect the values of your companies going forward." Ocasio-Cortez and Pingree also note the tech companies have installed sustainable practices in their respective businesses, and concede that conference sponsorship is commonplace. The congresswomen are asking Facebook, Microsoft and Google to reaffirm their commitment to a "more sustainable future." In a statement to CNBC on Monday, Facebook pointed to a 2017 blog post about the company's political engagement and to the company's sustainability policies. A spokesperson for Google told CNBC the company sponsors "organizations from across the political spectrum" and that "Google's sponsorship or collaboration with a third party organization doesn't mean that we endorse the organization's entire agenda or agree with other speakers or sponsors." Microsoft, in a statement, said the company's engagement with LibertyCon was "through a breakfast reception for student leaders to discuss topics including rural broadband and privacy." Liberals have the gall to make blanket statements like they are established truth, when in fact they aren't. 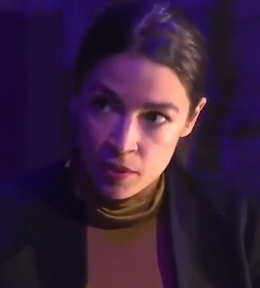 And when someone has the low-I Quotient of an AOC, the stupidity runs amok. Censor yourselves, or we will censor you. A familiar standard, from the usual socialist suspects.